Explanation: If you had x-ray vision, the center regions of our Galaxy would not be hidden from view by the immense cosmic dust clouds opaque to visible light. Instead, the Milky Way toward Sagittarius might look something like this stunning mosaic of images from the orbiting Chandra Observatory. Pleasing to look at, the gorgeous false-color representation of the x-ray data shows high energy x-rays in blue, medium energies in green, and low energies in red. Hundreds of white dwarf stars, neutron stars, and black holes immersed in a fog of multimillion-degree gas are included in the x-ray vista. 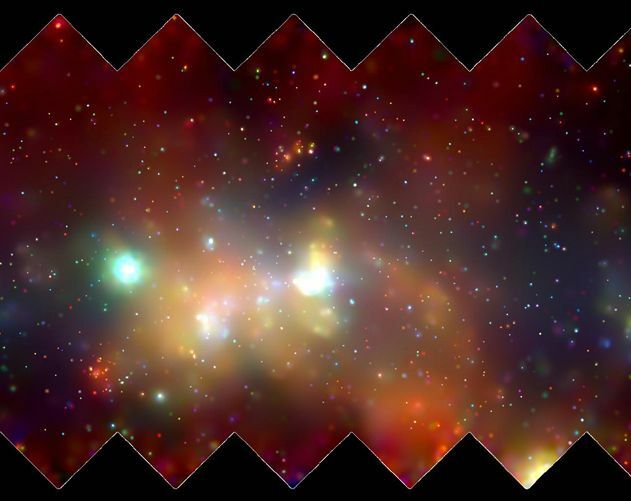 Within the white patch at the image center lies the Galaxy's central supermassive black hole. Chandra's sharp x-ray vision will likely lead to a new appreciation of our Milky Way's most active neighborhood and has already indicated that the hot gas itself may have a temperature of a mere 10 million degrees Celsius instead of 100 million degrees as previously thought. The full mosaic is composed of 30 separate images and covers a 900 by 400 light-year swath at the galactic center.